Moksha gives you more control over the editorial process, freeing you from the tedious tasks and giving you more time to focus on what’s important. When reading manuscripts, a lot of tasks are constantly repeated. 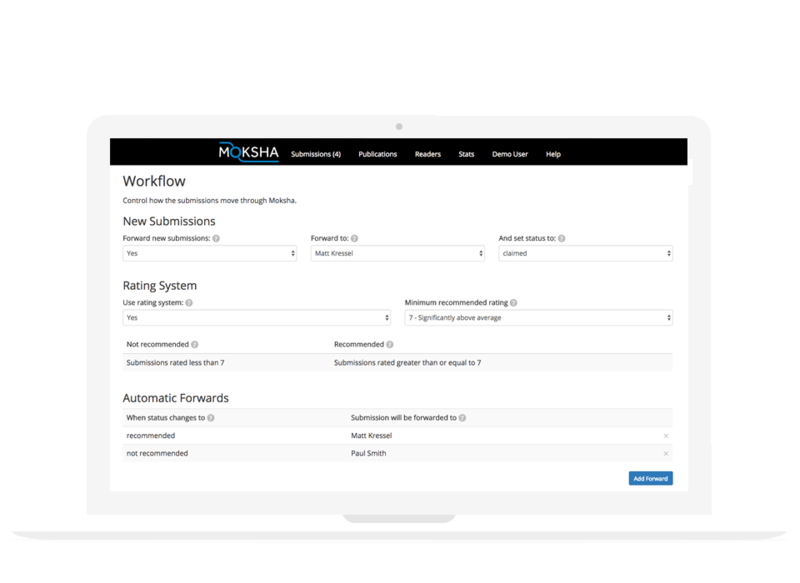 Moksha simplifies those tasks by automating them as much as possible, and reducing actions to just a few clicks otherwise. The end result is that you are spending less time on repetitive, administrative tasks and more time on the important things. But not every organization is the same, and so Moksha allows for complete customization of all options. You have full control over who sees submissions, when they see them, and how submissions move through the system. Moksha tries to allow for every possible combination of workflow and be as flexible as possible. The end result is a system that meets your organization’s needs. If your slush pile is getting out of control, Moksha is just the system you may need. To really see all that Moksha can do, see it in action. You can sign up for a free 14-day trial here.